You’re all played out. You’ve done everything the concrete jungle has to offer; flirted at all the clubs, imbibed at all the speakeasies, got your inner hipster on at Huashan, and even eaten that impossible-to-reserve Scandinavian tasting menu. What else you got, Taipei? To get out of town but still remain within the soothing doot-doot-doot sounds of MRT doors, head to the northernmost reaches of the red line to Tamsui, also known as Danshui. 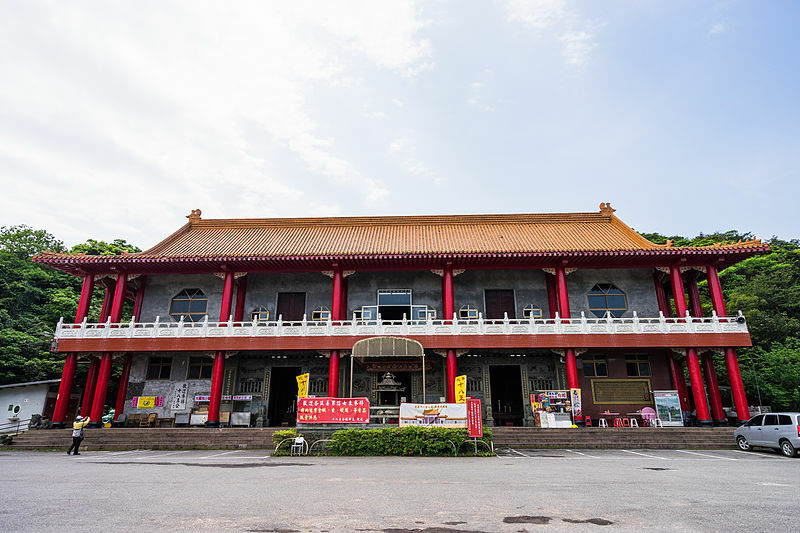 Let’s get this out of the way first – if this is your first time in Tamsui, you will undoubtedly head to Old Street and Fisherman’s Wharf. Conveniently located east of the Danshui MRT station, Old Street is a riverside promenade à la Santa Monica boardwalk albeit with less half naked bodybuilders on roller-skates. Trace the river while ordering two-foot long ice creams and barbequed squid, perusing the de rigueur tourist souvenir shops and perhaps stopping by one of the many whimsical cafes that have views overlooking the river. Best to do this during golden hour, when warm rays bathe every surface and people watching is at its peak. Walk further on and join the young couples wielding selfie sticks at Lover’s Bridge, a sweeping modern structure straddling the docked boats down below. For a less touristy and perhaps healthier experience, consider walking west to one of the many bicycle rental shops that dot the banks of the river. Instead of seas of people, you’ll find seas of foliage and impeccably managed biking trails. 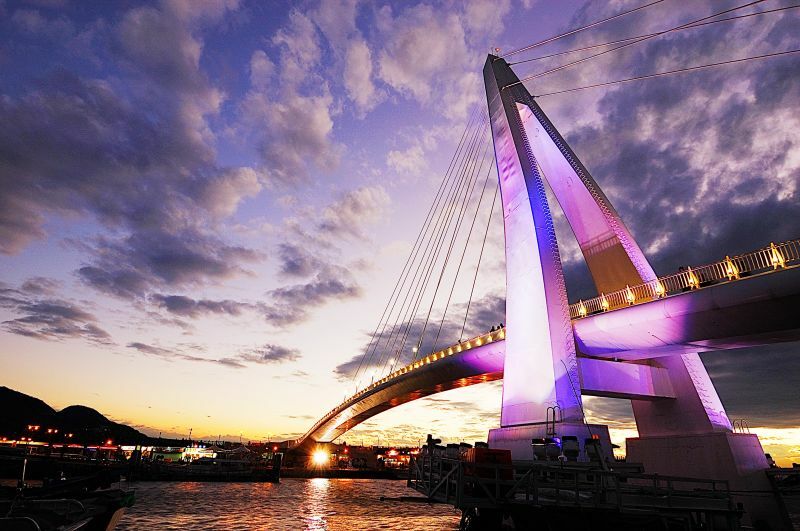 When you see the famous red Guandu Bridge, hit first gear and struggle up the steep ramp, where you’ll be rewarded with sweeping views of the river. Instead of going back the same way, cross the bridge over to Bali, Danshui’s sleepier cousin, and trace the river back the direction you came. 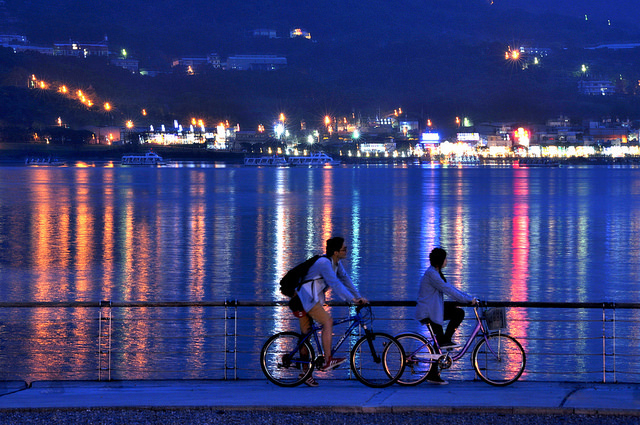 At the end of the day, catch a ferry back to the Danshui side as you pat yourself on the back for a job well done. Legend has it that seventeen fisherman and their dog was out at sea when their ship capsized, drowning all the men. The dog survived, but when local villagers buried the bodies, the loyal canine jumped in as well. Thus, the dog became the eighteenth deity and a massive double tiered temple was built in their honor. The temple was popular among the fringes of society (namely prostitutes and gangsters) due to its yin nature and you can see remnants of that today with the occasional still-smoking cigarette adorning the top of an incense stick. For extra creep factor, go in the wee hours of the morning when the night is at its murkiest and the spirits are said to be at its strongest. Much scary. Many haunt. There is no shortage of western-style cafes lining Old Street promising views and comfy seats to whittle away your afternoon in, but few deliver on the food. 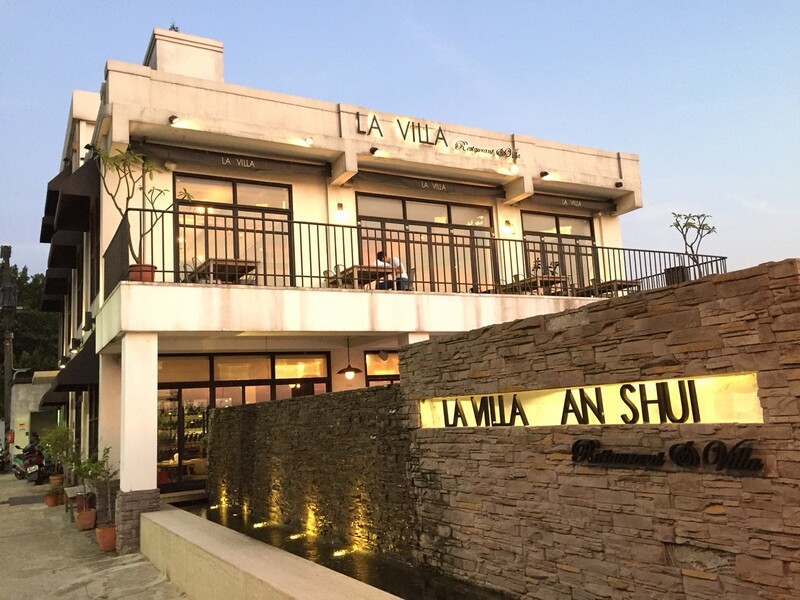 La Villa, a relative newcomer to the scene, changes all that with a two-story, glass number complete with al fresco dining. Its version of Italian staples like vongole and mushroom risotto are on point and cooked al dente. Even the salads are thoughtfully composed and bread comes straight from the oven with an addicting black truffle dip. Who’s next to you: Twenty-somethings rocking their sunglasses indoors. At night. Hidden among the McDonald’s and the lackluster riverside cafes, Large Footprint is an oasis in the food-starved desert. The restaurant serves a combination of Thai, Hakka and traditional Taiwanese inspired dishes, but this ain’t no misinterpreted fusion cuisine joint; this is the real deal. 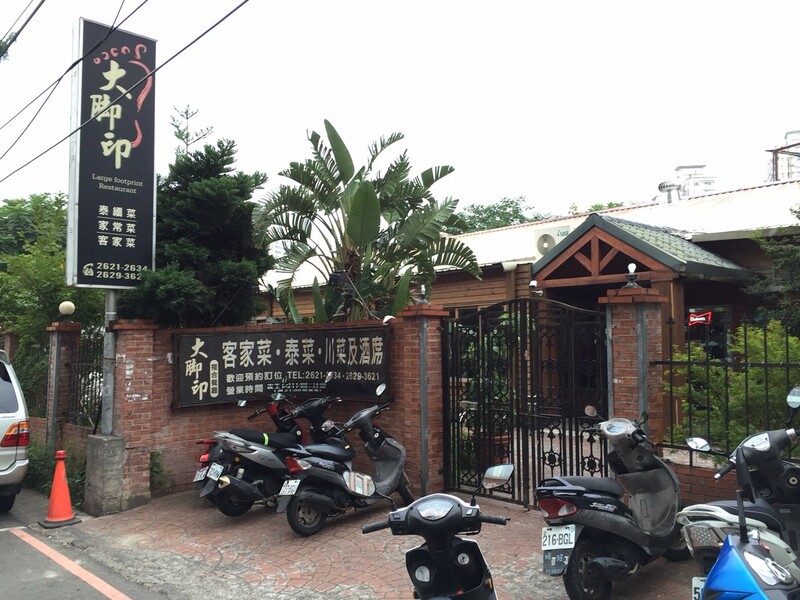 Everything you order will be top-notch but the Hakka stir-fry (客家小炒) and chilled beef (涼拌牛肉) are particularly good. If you really want to impress, call ahead to request any creature from the ocean you can think of (the owner’s brother is in the fish business) but be prepared to pony up for the privilege. Who’s next to you: University professors and in-the-know locals with their families. 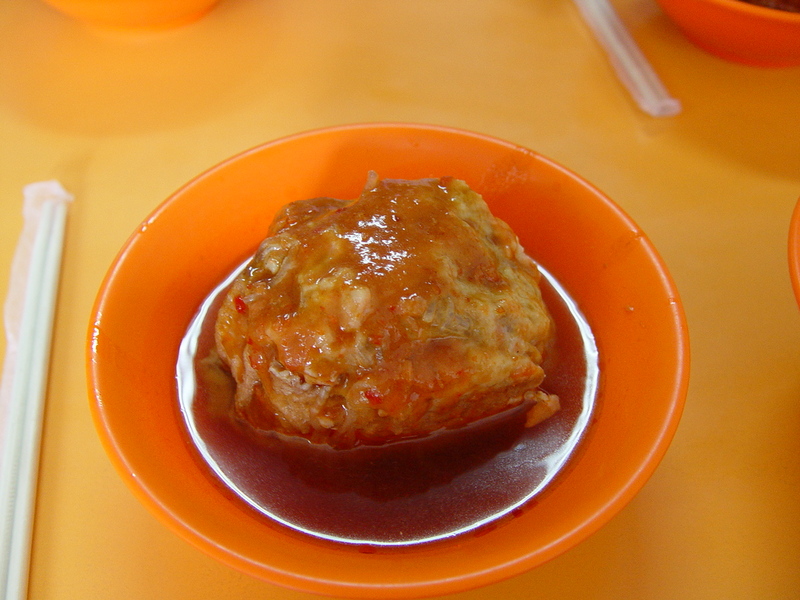 Fried bean curd, vermicelli and fish paste, served in a steaming broth; nothing more and nothing less. This humble breakfast snack is Danshui’s claim to fame. Throw on some of the house-made tangy/spicy sauce if you want a bit more of a kick. Who’s next to you: Aging locals and cyclists in colorful spandex fueling up before a ride.